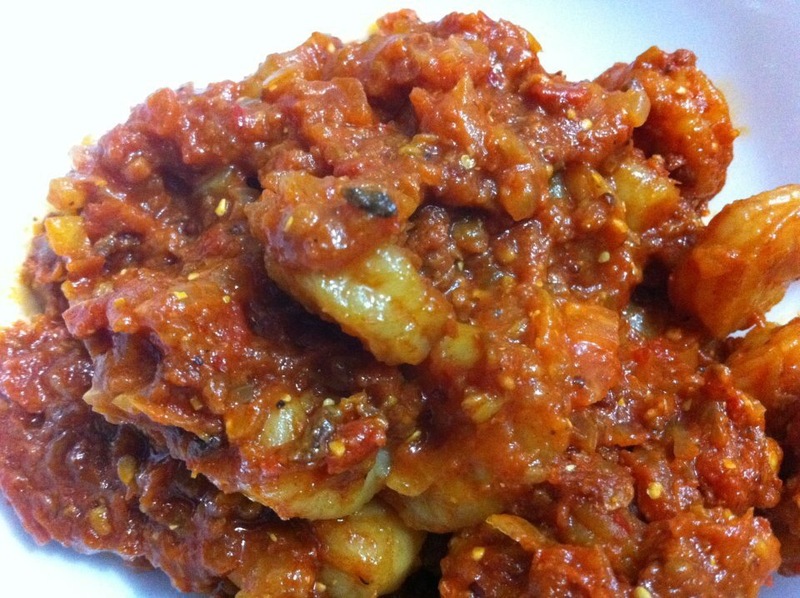 Prawn Balchão is a spicy seafood dish in Indian Goan cuisine. Balchão is a method of cooking either fish or prawns in a dark red and fiery tangy sauce. Balchão is almost like pickling and can be made days in advance without reheating. The traditional balchão uses a paste made from dried shrimp known as galmbo in Konkani. Balchão was introduced by Catholic Portuguese to Goa during colonization, balcháo originated in Macao (also once a Portuguese colony), where it is called bacalhau. Take prawns in a large bowl and sprinkle salt on them (if using raw). Keep aside. If using pre cooked drain them and saute using 1-2 tbsp of oil in frying pan. Roast the dry red chillies, cumin seeds, mustard seeds, cloves and cinnamon till they begin to release their aroma. Take off from the fire and cool. Grind the ginger, garlic and roasted spices into a smooth paste using the vinegar and tomato paste . Heat the oil on a medium flame in a wok-style pan. Add the prawns and stir fry till opaque. Remove from the pan and keep aside. In the same pan, fry the onions till light brown. Add the tomato and fry till soft. Now add the spice-vinegar paste, sugar and salt to taste and fry till the oil begins to separate from the masala. Add the prawns to this masala, mix well and cook for 2-3 minutes. Serve with piping hot, plain boiled rice.